When people today envision their health, they usually do not even take into consideration the level of their eyes health. However the eyes are relied upon more heavily than virtually any other component the body. Due to the fact that this is so, it is extraordinarily vital that you maintain the well-being of your eyes in order that you can continue to rely on them to get you through the day. There are plenty of ways to go about protecting your vision, however the one most critical thing you ought to do is book a thorough eye exam. No matter who you are or what your age is, a comprehensive eye exam will go a very long way towards making certain that your vision continues to be clear and healthy. The eye examination could be performed by any qualified eye doctor in your city. The eye doctor is trained to give their patients an in depth exam that includes various of the tests we will review below. If you have not been to the eye optometrist in more than a year, make a meeting for an eye examination as quickly as possible. So, let's have a look at some of the issues that an optometrist checks for during your checkup, and what they will do to rectify the issue. One of the initial thing that an eye specialist will look out for at the time of your eye exam is refractive error. Refractive error refers to an imprecision in the way that the eye fixates on light. The ultimate outcome of a refractive error is a drop in of visual acuity (i.e. acuteness or quality of vision). In cases of minor refractive error, patients sometimes decide to leave the situation uncorrected. However, if the problem infringes on the patient's ability to perform their everyday activities, then action needs to be taken. During your eye examination, if the optometrist would detect any refractive error, then the eye doctor would lay out the options for the patient. Most of the time, refractive error will be treated through wearing eyeglasses or contacts. In more acute scenarios, the patient may prefer to have refractive surgery. This can all be cleared up more by your local eye doctor in the course of the course of your eye checkup. One more thing to think about is the point that the eye could be subject to various illnesses, just like other part of the human body. Lots of people have heard of the most familiar problems of the eye, which include glaucoma and diabetic retinopathy. Due to the fact that these problems typically display no warning signs in their early stages, it is very important that you maintain an active strategy to avoid them. This can only be carried out by scheduling a visit to have your eye checkup each year. The eye doctor will be able to look for eye diseases like glaucoma so that you can take the suitable steps to eliminating the disease before it gets any worse. Even though these ailments are more generally found in more mature men and women, it is important to note that there is nonetheless a chance for eye disease to occur at an earlier age. There are many other conditions that your eye specialist will be checking for throughout your eye examination. As an illustration, the eye condition called Amblyopia, or lazy eye, is exemplified by its unsatisfactory vision in an eye that would be in different circumstances considered to be normal. Created by a feeble stimulation of vision by the optic nerve to the brain, this issue could be exacerbated if it is not dealt with straight away by an optometrist. Your optometrist will also look for Strabismus, one other eye problem where the eyes do not successfully align. This disorder prevents the patient's capacity to perform depth perception, and because of this should be diagnosed by an optometrist as soon as possible. In addition, it is important to distinguish between a basic vision screening and an extensive eye examination. Some people believe that by having a practical nurse or primary care physician provide a vision screening they are maintaining an effective grade of eye care. What they do not notice, however, is that the vision screening may just provide for the reading of letters off an eye chart which differs in size. 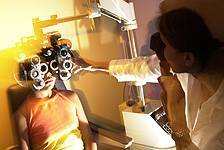 After factoring in the numerous other types of procedures and checks that have been looked at above, anyone will recognize that the vision screening does not consider the other many illnesseses and health problems that you may sustain. Therefore, by arranging a full eye examination completed on a consistent schedule, you can make sure that your eyes continued to be protected.